RUSH: Folks, they’re crashing at CNN. The nightmare continues. Now the GOP is getting on a bunch of buses in Charlottesville to go to wherever their retreat is. What will they hit next? Who’s next gonna be injured or wounded by the Republicans going on their retreat gloating after the speech last night and so forth. But I’m telling you: “GOP train hits dump truck.” It’s not a GOP train. It’s an Amtrak train and it was chartered by the GOP. Anyway, Trump’s approval number is rising. They don’t know why. This is a Monmouth College poll. So we have Jim Sciutto and the associate editor at Real Clear Politics, A.B. Stoddard talking about it. SCIUTTO: There’s a new poll from Monmouth where the president’s approval rating has ticked up to 42%. This is out of the thirties where President Trump has wallowed, one might say, for most of the time since his inauguration. A.B., why? Why do we think? SCIUTTO: But I know that the tax reform plan, at least in many polls, is viewed by a majority of Americans negatively. STODDARD: The polling on tax reform was really bad in December. It’s actually rising, becoming more popular. And either people are responding to their own personal data or they’re responding to these stories of corporations feeling a boost and sharing it with their workers. And that is a positive for him. It’s a legislative success, and it’s economics. RUSH: How could this be happening? Why is it happening, A.B.? Why? He’s ticked up to the forties. How can it be, A.B.? The tax — most people looked at it as a negative! That’s right, Sciutto, because you people were lying about it. You were telling everybody their taxes were going up! What do you expect people’s reaction to it to be when you’re lying to them? It is incalculable how wrong most media is now, purposefully, accidentally, incompetently. It’s wrong. It happens in business media, it happens in sports media, and it is happening in the news media, and has been for a long time. They were telling people that 80% of the American people will be getting a tax increase! That’s why the polling was so bad. They did it on purpose. They lied about it. And then they keep going back to it. A.B. Stoddard tells Sciutto, “Yeah, it’s changing because people are seeing they’re getting tax cuts, they’re living it.” So Sciutto then asks the question. SCIUTTO: Does that improve the chances of Republicans in the midterms? COLLINS: Well, it certainly raises some questions. RUSH: That was Kaitlan Collins of CNN. Does this improve the chances of Republicans in the midterms? 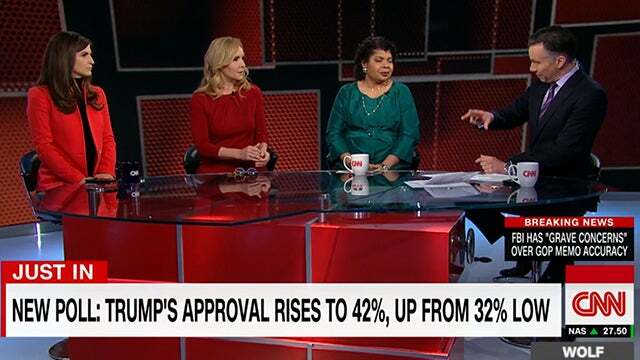 So there’s unrest and unease at CNN after the State of the Union and after the reaction to it, and now Trump’s approval numbers ticking up. I actually think they’re higher than 42%. But, again, in trying to figure out why the numbers are what they are, let’s say you want to believe. Let’s say you want to believe Trump’s approval number in this poll’s 42 and in another poll this week it’s 48. You have to remember some things. I keep harping on this. But, folks, you would not believe it. The numbers of people that only watch CNN or read the New York Times or their local news or LA paper, the local paper, those people are sizable in number. Those people have never heard of MS-13. They’ve never heard of Fusion GPS. They don’t know that Hillary wrote the Trump dossier, essentially paid for it, they don’t know this. That stuff”s not reported. All that is reported is a daily onslaught on Donald Trump. I think Trump at 42, 45, 48 is rather amazing. I don’t know there’s a human being in Washington who could tolerate, put up with, and triumph over the two years that Trump has had of character assassination multiple times a day every day. I don’t know that there’s any Democrat that could put up with it. I don’t know how many Republicans could. But they have more experience dealing with it.